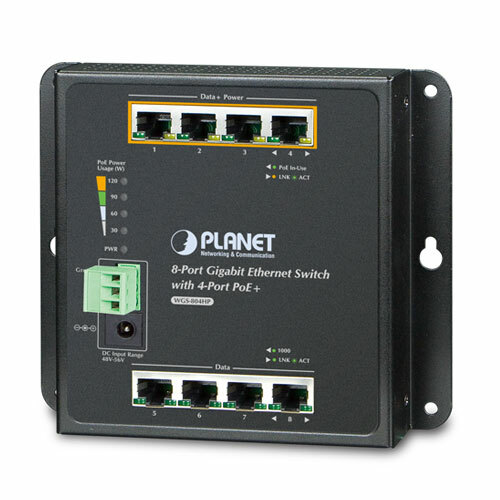 Designed to be installed in a wall enclosure or simply mounted at any convenient location on a wall, PLANET WGS-804HP is an innovative, wall-mounted industrial 8-port Gigabit Ethernet Switch with 4-port 802.3af/802.3at Power over Ethernet. 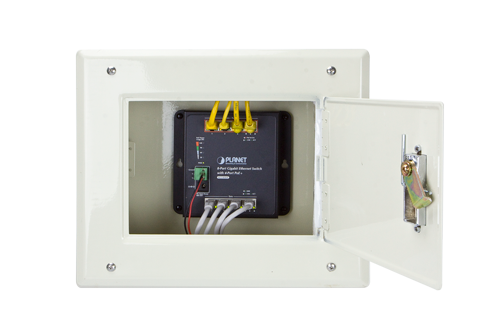 It comes in a compact but rugged IP30 metal housing. Featuring a total PoE budget of 120 watts, ultra networking speed and operating temperature ranging from -10 to 60 degrees C, the WGS-804HP is an ideal solution to meeting the demand for sufficient PoE power for the following network applications. The WGS-804HP is able to operate reliably, stably and quietly in any environment without affecting its performance, and provides a quick, safe and easy deployment of PoE PDs with power feeding. 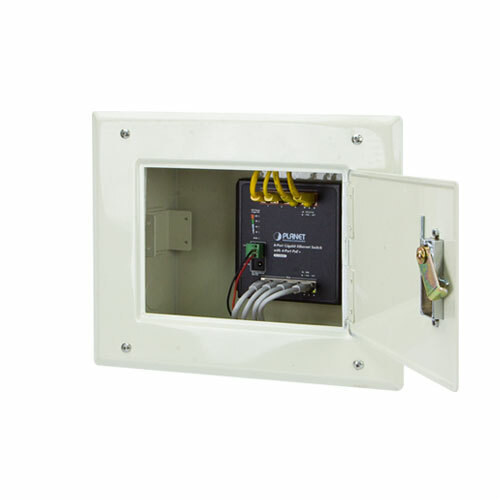 The WGS-804HP is specially designed to be installed in a narrow environment, such as wall enclosure or weak electric box. The compact, flat and wall-mounted design fits easily in any space-limited location. It adopts “Front Access”design, making the installing, cable wiring, LED monitoring and maintenance of the WGS-804HP placed in an enclosure very easy for technicians to manage. The WGS-804HP’s fixed wall mounting, magnetic wall mountingor DIN rail installation enables its efficient use of enclosure space, thereby making its usability more flexible. The WGS-804HP provides four PoE ports that combine up to 120 watts of power output budget for catering to small scale of PoE network applications. Compliant with both IEEE 802.3at and IEEE 802.3af Power over Ethernet standards, each PoE port supplies up to 30 watts of power output and data transmission in Gigabit speed both delivered over one Cat.5e/6 Ethernet cable, powering remote PoE PD at distance up to 100 meters. To facilitate auto power management, the WGS-804HP implements Power Budget Control function that helps to prevent power budget overloading. Moreover, the WGS-804HP helps users to monitor the current status of PoE power usage easily and efficiently via its advanced LED indication. 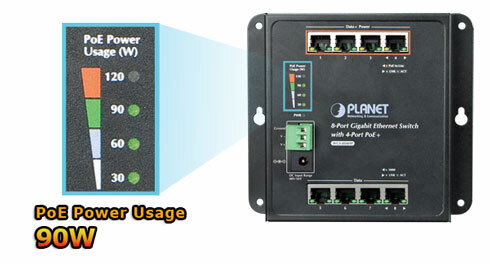 Called “PoE Power Usage”, the front panel of the WGS-804HP has four LEDs indicating <="" b="">and 120W of power usage. Internet is very popular the world over as users surf online daily with their mobile devices, such as smart phones and tablets, or laptop computers. However, users want more from the Internet, like how to use their mobile devices to control something via the Internet, thus making life more convenient. The WGS-804HP is based on such concept to help users implement the Internet of things (IoT) on the PoE network. Home automation is no longer a dream as Gigabit network performance plus power over Ethernet can easily drive IoT equipment, making it a smart home. Carrying both Ethernet data and power simultaneously, the WGS-804HP reduces cabling requirements and eliminates the need for dedicated electrical outlets on the wall, ceiling or any unreachable place. It helps users to utilize just one Ethernet cable to install and deploy IP camera, wireless AP or VoIP phone more efficiently and cost-effectively. 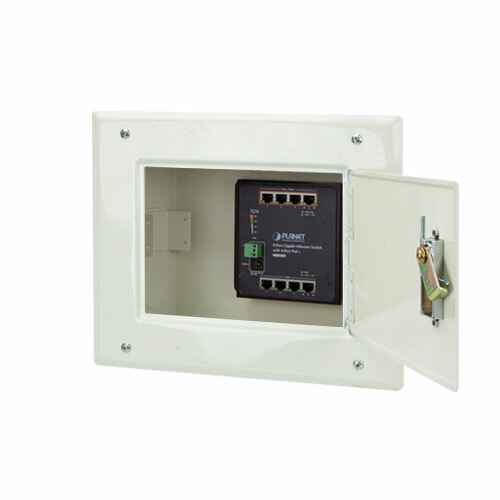 Providing 4 PoE, in-line power interfaces, the WGS-804HP can easily build a power centrally-controlled for an IP phone system, IP surveillance system, and wireless AP group in the harsh Industrial environment. For instance, 4 PoE IP cameras or PoE wireless APs can be easily installed for surveillance demands or building a wireless roaming environment in the industrial area. Without the power-socket limitation, the WGS-804HP series makes the installation of IP cameras or Wireless APs easier and more efficiently. With its expanded home-use feature, the WGS-804HP 802.3at PoE+ Switch helps SOHO / home users to create an integrated network where power is so easily utilized for transmission of data and video. The wireless AP and PoE IP camera devices work perfectly with the WGS-804HP, which injects power through the Ethernet cables, thus helping SOHO / home users to build a cost-effective and reliable PoE networking environment easily. * The actual power output may vary on the external power system with maximum 120 watts PoE budget for the switch.